Land Shark!! : 2009 Eastern Conference Champs!!! 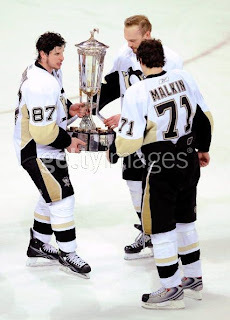 Congratulations to the 2009 Penguins!!! The Penguins decided to bring out the brooms last night and sweep the Hurricanes off to the golf course and bring home the Prince of Wales Trophy for the second year in a row!! I was very surprised that they were able to handle the Canes as well as they did. They earned this sweep after several good series with the Flyers and the Capitals. Despite a rousing kick off by Benedict Cowher and an early goal by Eric Staal, the Pens were able to move on to the Stanley Cup Final! However things are not finished for this team... They have a burning desire to make up for the loss to the Red Wings in the finals last year. After the game tonight, we could be looking at a rematch. This year, the Penguins will be ready to go! 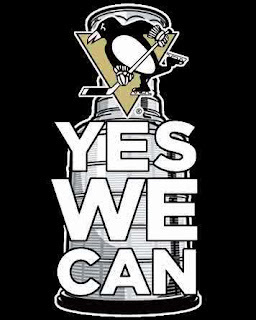 As the image below from the Pensblog says: Yes We Can!! !